Mix all the ingredients together except oil and make a batter that is neither thick nor too flowing. I have mentioned approximate quantity of water according to my observation. You might need a little more or less. Please refer the pic below for batter consistency. 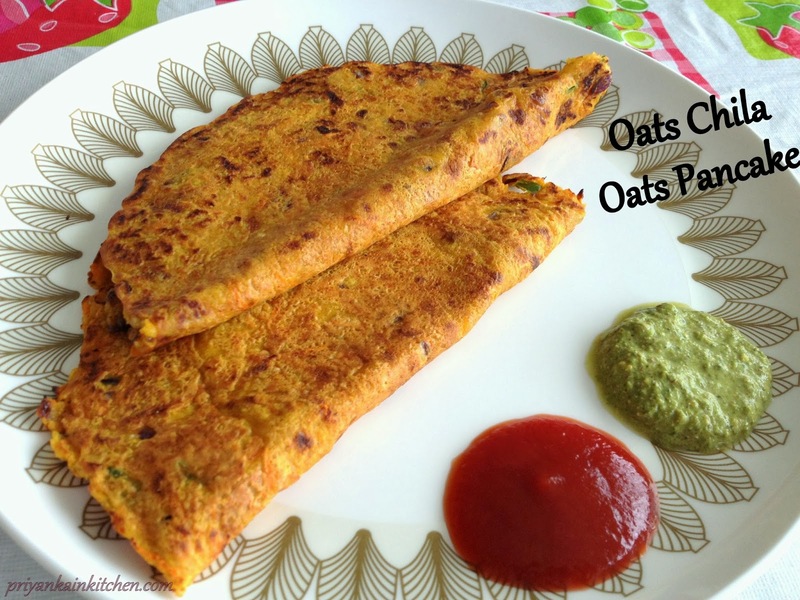 Let this batter stand for 10-15 mins to let oats absorb the water. Heat a skillet or a pan. Grease it. When its hot enough, reduce the heat to minimum. Now pour approximately 2 ladles of batter in the center, and spread it outwards using the back side of the ladle, to form approximately 8 inch diameter circle. Let it cook on low heat until the top side of it turns dry as shown in picture. Drizzle few drop of oil on it. Now carefully flip it and cook it on high for few mins. You can flip again until its done completely. This batter generally yields 8 chilas of 8 inch diameter. But varies according to the thickness. For crisp chilas, try to spread thin layer and press it with spatula while cooking.